What is the kinetic energy? If you're analyzing an object traveling at high speed, you will probably observe that the results provided by our regular kinetic energy calculator are not entirely accurate. 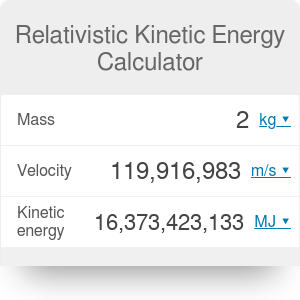 In such a case, make sure to use this relativistic kinetic energy calculator that takes into consideration relativistic effects. Kinetic energy, by definition, is the energy resulting from the motion of an object. For example, a car traveling along a highway has certain energy - if it hits another vehicle, the outcome will be much more destructive than if it were moving at 5 mph. If the object moves at high velocity - at least 1% of the speed of light - relativistic effects begin to be noticeable. Due to that fact, you can no longer use the simplified formula mentioned in the previous section. m₀ is the rest mass of the object. If you're interested in relativity, check out the velocity addition calculator, too! Relativistic Kinetic Energy Calculator can be embedded on your website to enrich the content you wrote and make it easier for your visitors to understand your message.